The manufacturer may produce any one of 14 different cooking ingredients for the food industry on any given day, depending upon their customer requirements. Given the wide range of materials used and their respective particle/dust properties, individual explosibility characteristics had to be considered carefully in addition to the process plant design criteria to propose an explosion protection solution capable of providing appropriate protection as well as offering cost-effective long-term operation. Many industrial manufacturing processes are inherently exposed to the risk of an explosion, whenever fine particulates dispersed in the air are subjected to an ignition source within a contained environment. While the initial step in good plant design is always to control any potential ignition sources (typical examples include hot surfaces, open flames, mechanical friction or uncontrolled electrostatic discharges), often the risk cannot be totally ruled out therefore measures to control or mitigate the disastrous effects of an explosion event (deflagration) must be put in place. In this particular case, the process begins with wet slurry being introduced into the spray dryer, which is then dispersed into the heated environment and dried into fine particles. The particles are then discharged and pneumatically conveyed to 4 “Quad” Cyclones where lighter material is separated out while the heavier material is conveyed to a 5th cyclone for further separation. Finally, the material meeting the required specification for the process is transferred to the next stage elsewhere in the plant while the lighter material is returned to the start of the drying process for re-mixing with the incoming material. Spray drying processes always pose an explosion risk as they not only agitate the suspended dust particles in the air but also by their very nature introduce high temperatures which may create the initial ignition source under optimum conditions. In addition to this the 5 cyclones downstream continuously hold combustible dusts in suspension, making them susceptible to any ignition source transferred from the dryer via a deflagration or in hot/burning material originating from the spray dryer itself. As an added dimension to this application, the spray dryer presented a further explosion protection challenge in view of its large volume – over 400 m3, as well as its low vessel strength. Taken together, these factors provided a uniquely demanding set of conditions for IEP to consider before proposing a practical and economical solution. The first step for IEP was to conduct testing of the materials to determine the explosibility properties. A third party had previously tested one of the products, but the other 13 were tested at the Combustion Research Center (CRC) in Marlborough, MA, an independent test laboratory specializing in the combustion hazards testing of dusts, liquids, and gases. Once collated, this data was used to exhaustively model different explosion scenarios for the vessels in the ingredients manufacturer’s spray drying process. 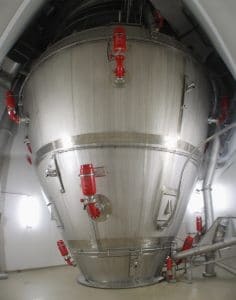 The method of explosion protection selected involved installing pressurised cylinders to rapidly discharge explosion suppressant into the protected area in milliseconds upon activation, however the unusual combination of large spray dryer vessel size (> 400 m3), along with its low vessel strength rating meant that a high number of cylinders would normally be needed to mitigate or isolate an explosion. However, after analyzing and modeling the spray dryer operation, IEP’s design team was able to avoid using an excessive number of suppression cylinders by using a recognized methodology where a reduced explosible volume can be usedbe used as the basis of the explosion suppression for spray drying processes of a specific design. 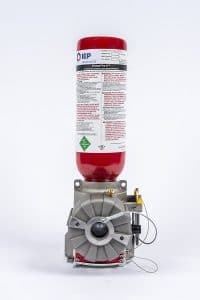 The principal observation is that, as the top section of some spray dryers do not contain dry combustible dust, explosion suppression of the entire volume is excessive and unwarranted. This technique allows for a reduced amount of suppressant to be delivered to the upper “wet zone” to maintain its inert state, while explosion protection is concentrated in the lower zone containing dry combustible powder, resulting in a reduction in the number of suppressors needed for overall protection. In North America, NFPA codes allow for this technique based upon performance-based approvals. Several “Piston Fire II” high-rate suppression and isolation cylinders were specified as part of the explosion protection system, offering the additional benefit of having Class II Division 1 hazardous location approval. These suppressors, as well as the SMARTDS dynamic explosion detection system, are electrically connected to an EX8000 Control Panel with the capability to selectively activate specific suppressors in the zone where the deflagration is occurring. 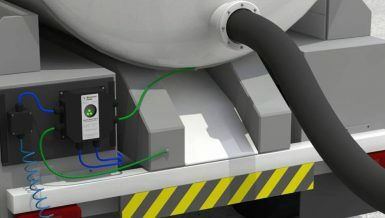 The overall solution met the stated needs of the customer by providing highly targeted mitigation of explosion events at the same time as reducing the cost of equipment, installation and ongoing maintenance. By ingeniously combining experience and research done around the globe, IEP Technologies demonstrated their specialist know-how, capabilities and versatile range of explosion protection products to create a practical and effective custom engineered solution. The Marlborough, MA-based company is part of the global HOERBIGER Safety Solutions network, with sales, service and support centers located across North America, Latin America, Europe, the Middle East/Africa, and Asia/Pacific.